StarTrackCam connects camera tracking data delivered in real-time from the MO-SYS camera tracking system StarTracker to AUTODESK MotionBuilder in order to support real-time previs or virtual production. 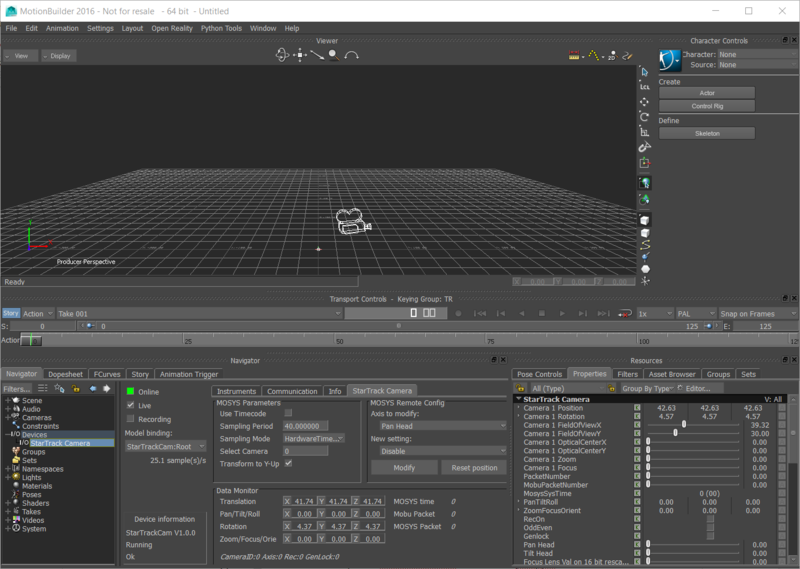 Camera position, orientation and zoom/focus/iris encoder values are delivered to the MotionBuilder PC via serial connection and used to control a virtual camera in the realtime render engine of MotionBuilder. Virtual sets created by generic modelling tools such as AUTODESK Maya or 3D Studio Max can be merged with the live camera data by converting the sets to Autodesk FBX and importing them in MotionBuilder. An evaluation version is available below free of charge. Please contact us with you studio name and address to receive the password for the ZIP archive . Please also contact us in case you need a production license after a successful evalution. Evaluation version for StarTrackCam 1.1.0 for Windows 7/8/10 64-Bit available since 2017-09-15 supports also Mobu 2018. Please note, the evaluation period expires 2017-11-01 automatically. Test it and give us feedback ! The software StarTrackCam is available free of charge for evaluation purposes. If you need a production license, please contact us. Please send us bug reports and requests for new features and improvements via email to startrackcam<remove_this_please>@ecke<removeaswell>svision.com. You need a valid AUTODESK MotionBuilder license installed under Microsoft Windows 7/8/10 64 bit workstation or laptop and a StarTracker system to benefit from the plugin. Connect the MO-SYS gateway box with a RS422 cable to the MotionBuilder PC or use a Serial-USB-Converter on the PC/Laptop side in order to make the camera tracking data available in AUTODESK MotionBuilder. BTW, if you own a MO-SYS gateway box and some of the tracking equipment encoded by the T4 protocol of MO-SYS, you can still benefit from this plugin since it makes all properties encoded as T4 protocol properties available in AUTODESK Motionbuilder as input animation channels.